low carb | Yikes! No Carbs Please! We started 2014 with guests over on the first weekend and they requested a meal without carbohydrates! Well, that’s not a problem for me, is it? Mix all the ingredients for the marinade together. Cut the chicken into pieces, reserving the back for another use (e.g. making chicken broth). Make slits on the bigger pieces. I usually cut the chicken breast into 3 pieces. Put the chicken pieces into a glass bowl, cover with marinade and let stand overnight or for at least a couple of hours. The next day, when ready to cook, soak the mushrooms in hot water for about 20-30 minutes till soft and slice. Remove the chicken from the refrigerator and let stand at room temperature during this time. Heat some oil in a wok or large non-stick pan (with a cover). 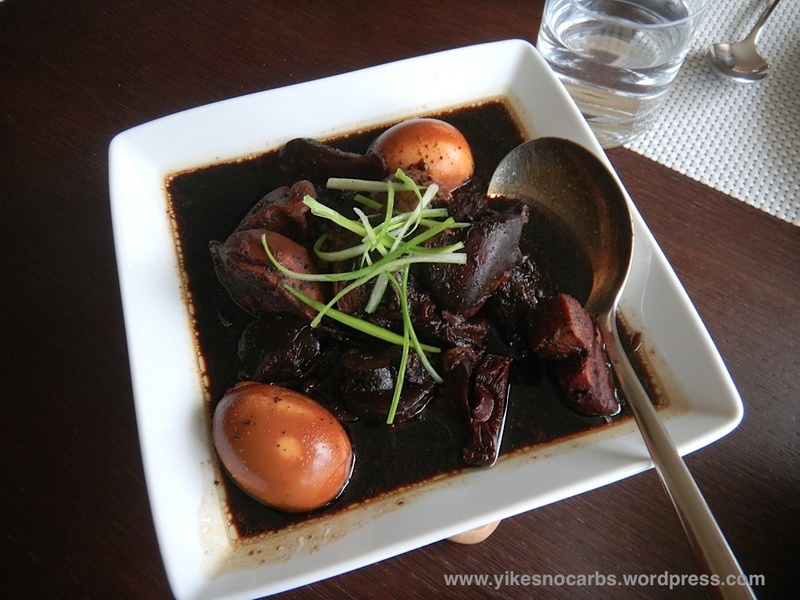 Remove the chicken pieces from the marinade and brown in the wok or frying pan on all sides. Take out the chicken and reserve on a plate. Sauté the onions in the same pan adding a bit more oil if necessary. Parallel to this, boil the marinade in a small saucepan for about 5 minutes. When the onions are lightly caramelized, put back the chicken and add the hot marinade and sliced shiitake mushrooms. Put in the star anise. The chicken and mushrooms should be almost covered with liquid. If there is too little, add more water and a bit more of the two soy sauces. Bring the chicken in the marinade to a boil, turn down the heat, cover and let simmer for about 30-45 minutes till the chicken is done. If you like your chicken very tender and almost off the bone, simmer it longer. When the chicken is almost done, check the seasoning, adding salt/soy sauce or erythritol if necessary and put in the hard-boiled eggs. Turn the eggs after 1-2 minutes so that the other side will get brown too. Garnish with green onion curls, serve with a vegetable stir-fry and lots of cauliflower rice to soak up that delicious sauce! Oh, oh … what to do. Nothing much left in the fridge and today is Sunday. Shops don’t open on Sundays in Germany. After taking stock of the situation this morning, I found some broccoli in the freezer. Googled and found a couple of pasta and broccoli recipes. 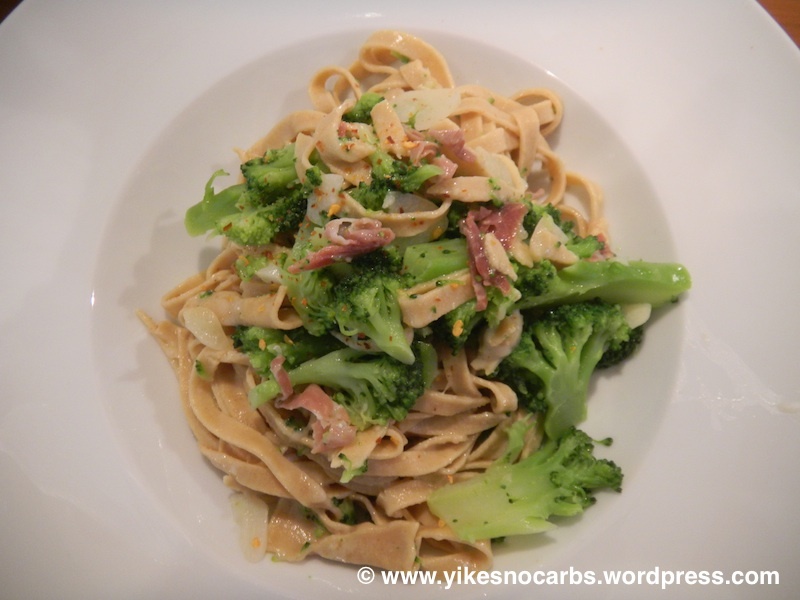 Can I be bothered to make some low carb pasta? Why not, I didn’t have much planned for the morning anyway. Looking through the recipes online, I couldn’t find any that suited what I had on hand. The simple ones seemed to boil the broccoli to death while others used onions and anchovies which I didn’t fancy using. So I just looked at what they used, decided what I would put into mine and viola, came up with this version. 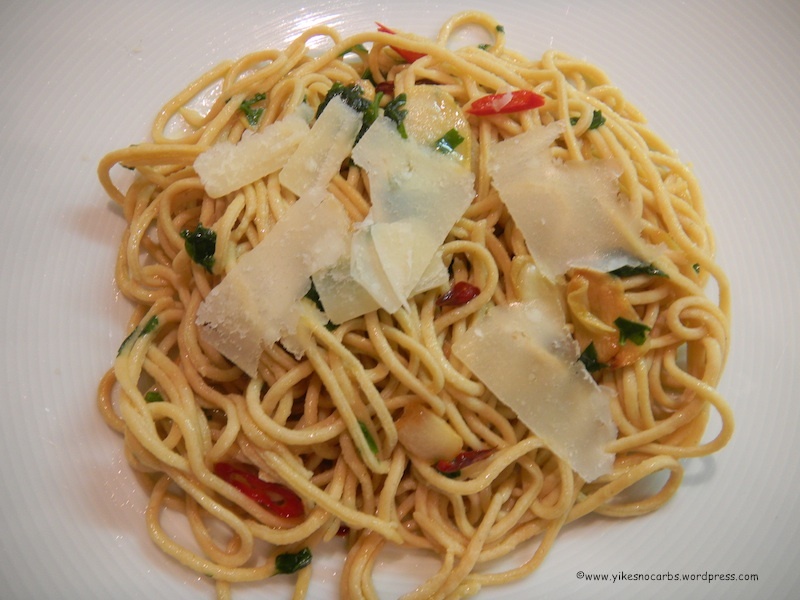 Except for the pasta making part which really isn’t so bad, this recipe is quick and easy. I like making loafs – you just mix all your ingredients together in one bowl, turn the mixture into a pan and bake. While your loaf is baking, you’ll have plenty of time to make the accompaniments. If you choose to accompany your meal with a big salad or cauliflower rice, these can be prepared in a jiffy, leaving you the rest of the time to do something else. 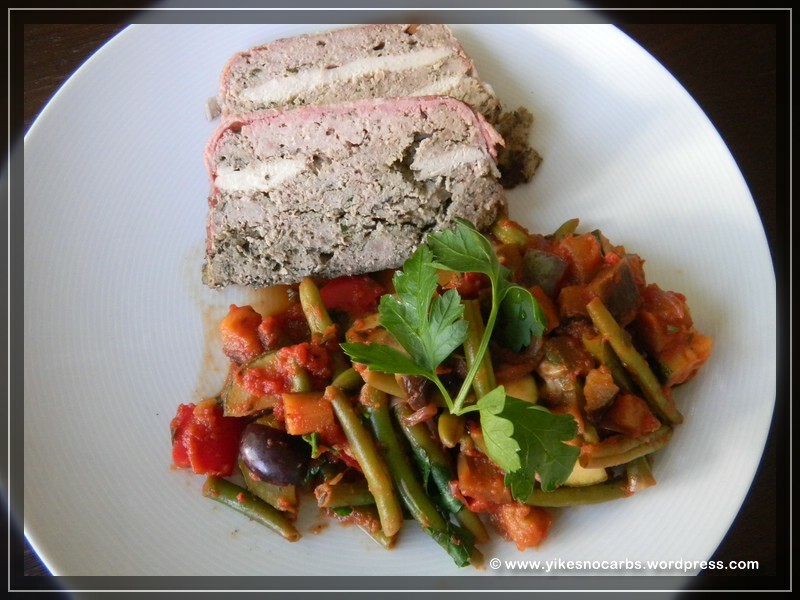 Since going low carb, I’ve made a meat loaf (yep, can you believe it – only one meat loaf!) 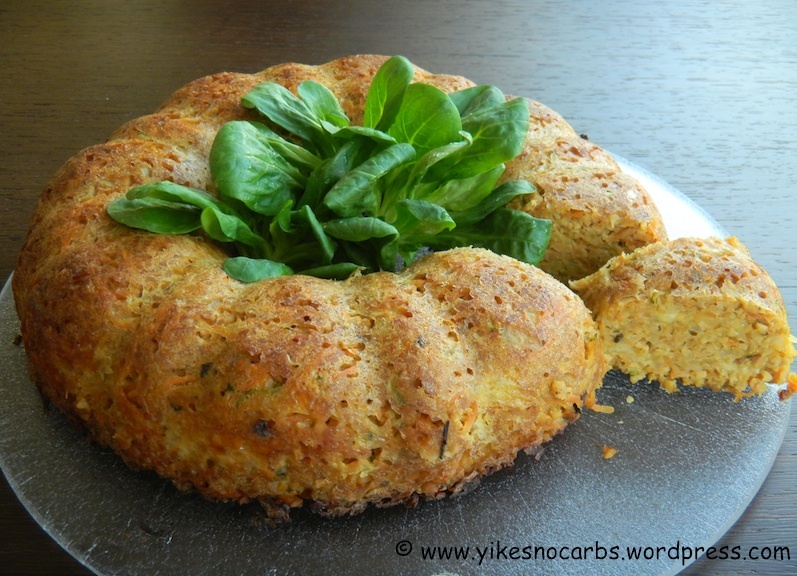 but haven’t been able to find a vegetarian loaf recipe without carbs until just recently. Most loaf recipes call for the addition of flour, oats, rice or some other kind of starch. This recipe, however, requires only 2-3 Tbsp flour so I thought it should be easy enough to get rid of. I’ve made this loaf with flour before and honestly, I couldn’t tell the difference between the ‘flour’ loaf and the low carb loaf. If you are refraining from eating soy products, the loaf does, as the title says, contain soy – well, the bulk has to come from somewhere. This versatile recipe allows you to substitute vegetables. It also doesn’t matter if you use a bit more or less of the vegetable quantities. Just make sure that whatever veggies you choose don’t give off a lot of liquid on cooking. Hope you enjoy it as much as we did. I would recommend serving slices of the loaf with a tomato sauce and a side salad. Make your schnitzel low carb! Busy, busy, busy – that’s what I’ve been since 2012 started. January is already half over and only now am I able to wish my blog visitors a Happy New Year! So, HAPPY NEW YEAR and may you have a successful 2012 low-carbing! Since I’ve been so occupied with other things, I haven’t had time to do any experimenting. After trying to get my Black Forest cake base perfect before Christmas and having had to eat so much bad cake, I’ve kind of had it with heavy duty experimenting for a while. 🙂 I’ll pick up on that sometime later during the year to get it right. The last cake actually wasn’t bad but I think it can still be made better. Aside from that, I did find a little time to have another take on perfecting my low-carb schnitzel coating and I must say, I am now very satisfied! So I’m happy to have something to share with you this January. Doubt if I’ll have time to do much more. If you’re thinking, schnitzel is meat and it’s low carb and if you pair it with a big salad, all should be ok – then think again. Schnitzel meat is first coated in flour, then egg, then breadcrumbs. For someone very sensitive to carbs, like me, this had a big effect on my readings. Ok, if I had known and taken more insulin, I wouldn’t have been surprised but I calculated my insulin for the meal on the basis of salad and protein and not salad, protein and some carbs. I once bought a cooked schnitzel – can’t remember if it was pork or chicken, but that’s irrelevant – from the neighborhood deli to go with my salad and couldn’t believe my blood glucose reading after the meal. The same happened with frozen ready-made schnitzel you just pop into the oven. You would think that the little bit of breadcrumbs around the schnitzel won’t make much difference but it did to my body. When you buy a ready-made schnitzel or cordon bleu schnitzel, there’s no telling what kind of seasoning they add to the breadcrumbs, meat or filling – probably a load of stuff you don’t need including sugar as well! 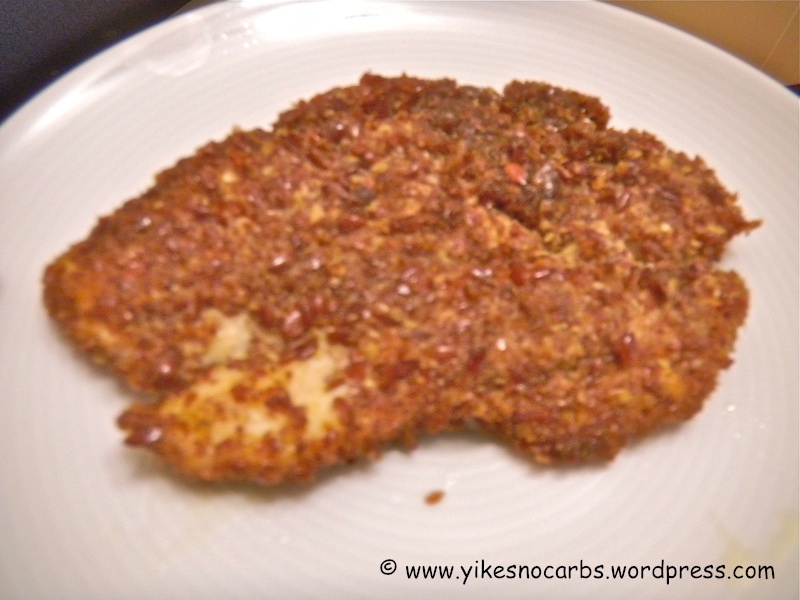 After these experiences, I tried to make my schnitzels low carb by using almond meal and even flaxseed but the coating did not stick as well to the meat. Last week, I tried it with gluten and flaxseed and it turned out really, really nice. When you cut the schnitzel, the coating does not fall off. So here’s how to make it. You can use pork, chicken or veal. My guess is the coating will also stick well to tofu and seitan but I have yet to test it. Please do leave a comment, if you do try it and let me know how successful you were. My schnitzel below is made with chicken. If you wish to make a cordon bleu schnitzel, simply buy a thicker piece of meat, slice a pocket in the meat and fill with cheese and/or ham. Sorry for the unclear photos but the schnitzels have already been devoured so I can’t retake them! 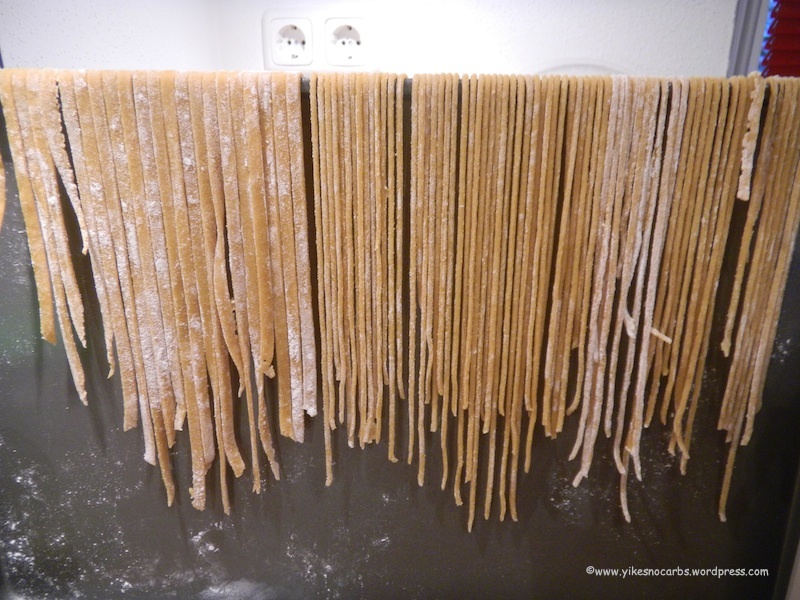 I found this wonderful recipe to make soy pasta during one of my google searches for low carb recipes on a German forum for owners of a wonder kitchen multitask machine – it can do almost everything under the sun and is called Thermomix. If I were just starting out and had a bare kitchen and that kind of money to spare, this looks like a great thing to have. Well, unfortunately, I can’t afford the machine (the new model costs over €900) but I nevertheless tried the recipe. Or rather, I took the ingredients and used my own method since I did not possess the machine and could not relate to the instructions. I also did not want to use my bread machine as my Low Carb Sunflower Seed Loaf made in the machine was less successful than the version made by hand! 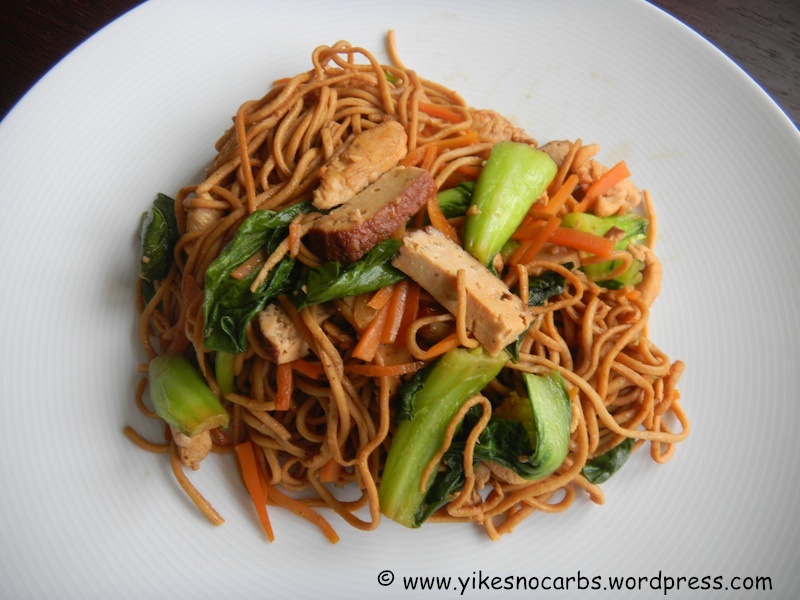 Result – I came up with some amazing low carb noodles! Thank you, Sputnik (pen name of the recipe owner on Wunderkessel). I have a cookbook called The Essential Pasta Cookbook and in the past, I really enjoyed cooking from it. But sadly, it was relegated to the back of my bookshelf when I stopped eating carbs. I even considered throwing it away so that I would not be tempted to make anything out of it. Well, I am so glad I didn’t throw the book away. Over the course of the last two and a half months, I’ve made Spaghetti Bolognese, Spaghetti Aglio Olio, Cannelloni, Lasagne, Chicken Vegetable Noodle Soup, Fettucine with Chicken and Mushrooms, Tagliatelle with Feta, Spinach and Sun-dried Tomatoes and Chinese Stir-fried Noodles, just to name some of them, not all from the above book though. Inconsistent Nutritional Information – What’s right? Do you like me, look at the nutritional information on the back of food item packagings before purchasing? I do – to check the carbohydrate count in an effort to keep down the amount of carbohydrates I eat. As I do this more often and become more familiar with the amount of carbohydrates a particular item is ‘supposed’ to contain, I have come to realise that there are inconsistencies. One producer will list a figure and another will have a figure waaaay off! We are not talking about small differences but sometimes double the amount. I’ve already come across 3 food items where I’ve ask myself, so now, who is correct? And I’m talking about comparing ingredients in their most basic form where nothing is added and comparing weight for weight. For example, almonds. Looking randomly through websites from 3 countries listing nutritional information for 100gr raw almonds, these were the values. A UK website called Weight Loss Resources states that 100gr of raw almonds contains 8.1 gr carbohydrates; the nutritional information on the back of the almond packet I always use says 100g raw almonds contains 9.4 gr carbohydrates, while Spark Recipes, the website I use to calculate the nutritional values of my recipes, says that 100gr raw almonds contains 19.7 gr carbohydrates. I have come across others which say 21gr or 22 gr carbohydrates per 100gr and these are usually American websites. That’s double the amount! Same with dried apricots. I bought a packet of organic dried apricots not too long ago from a supermarket here in Munich which listed the carbohydrate content of 100gr as 39 gr carbohydrates. According to American online retailer Nuts Online, 100 gr organic dried apricots have 72.5 gr carbohydrates! Healthy Supplies based in the UK have apricots with 58 gr carbohydrates per 100 grams. Again, a huge discrepancy. Yesterday, I had another shock. The brand of soy flour I use, produced by a reputable German organic products manufacturer called Sobo, says that 100gr of soy flour contains 3.2 gr carbohydrates. Spark Recipes’ calculator says 35.2 gr carbohydrates – that a whopping 32 gr difference! I’ve surfed around and there are other sites which say that soy flour has 3+ gr of carbohydrates and a lot more which say that it has 30+ gr of carbohydrates. And this has nothing to do with whether the soy flour is full-fat or defatted. Obviously, if I am using 3.2 gr carbohydrates per 100gr in my calculations, the final carbohydrate value of my recipe will be a lot lower than if I were to use 35.2 gr!! These are just the 3 inconsistencies I noticed. There must be many more items like this. We are fed with all kinds of information, right and wrong, and are often misled without being aware of it. So although I do try to be accurate when I do my nutritional calculations, I may not be giving you the right information. For me though, I think what is important is how my blood glucose values react to the meal I have consumed – if my values are acceptable, then I’m happy! Not sure what I was looking for but I landed on a blog by Mariana Cotlear called Epicuriosa which featured a recipe for Cauliflower Fries. Hmmm… something to replace french fries? Some dishes just have to be eaten with fries – for example, German bratwurst or a Wiener Schnitzel. These are traditionally served with some kind of potato accompaniment – mashed potatoes, fries, sauteed potatoes – or for those in a hurry, in a bun. All carbs! So far I’ve been having these dishes with either a big salad or cauliflower mash so a french fries substitute certainly got my interest. I’ve tried Mariana’s recipe – twice already. The cauliflower fries are really delicious! The recipe called for a head of cauliflower for two servings. My head of cauliflower usally makes about 4-6 servings of cauliflower rice, so two servings of cauliflower fries seemed like two large portions. Well, I was wrong. What happens is that the cauliflower looses its water content while baking in the oven and shrinks heavily. They may look burnt in the photo below but they are very tasty and lightly crispy and you won’t be able to stop eating them. Tonight I was having dinner alone and there was a lot of cauliflower in the fridge so I opted for a quick, no-fuss dinner – cauliflower fries accompanied by a few slices of chicken breast. This was also my opportunity to take some photos. I cut up half a head of cauliflower which filled my whole baking tray. I forgot to take a photo before putting it into the oven. 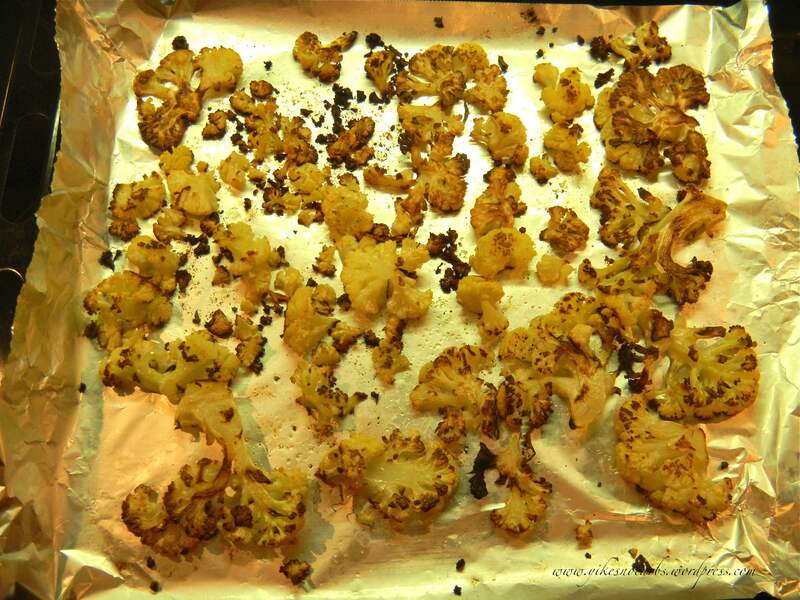 Here are the cauliflower fries after they came out of the oven. The tray was packed with cauliflower when I put it into the oven. Just look at how scant it looks now. Click on the photos to enlarge. On hindsight, this is not a practical recipe for two or more people. I ate the whole tray of cauliflower by myself. That means that you would have to bake each person’s portion individually. Not sure how they will turn out if you use two baking trays and rotate them halfway during baking. The first time I made these, my husband and I were having dinner together and we felt we didn’t have enough fries. If you are having your meal alone, are two small eaters or are looking for a yummy snack, I do recommend these low carb fries. Update 9 Oct 2011 – I made the fries again today. This time, I needed my oven to bake the pork fillet as well so I put the tray with the cauliflower on the bottom third of the oven, beneath the tray with the pork. It took about 5 min. longer for the cauliflower to get brown on the bottom ie. 20 min instead of 15 min, before I flipped them over. Also, I noticed that half a head of cauliflower was sufficient as an accompaniment for both myself and my husband and was wondering why. Then I realised that the cauliflower did not shrink much at all. It didn’t have that light crisp when you bite in either but they were nevertheless good. So if you want your cauliflower to stretch for more people, cook them on a lower temperature (200 degrees Celsius) and they won’t shrink that much! Clean the cauliflower of any leaves and trim the tough part of the bottom stem so that you get a flat surface. Stand the cauliflower upright on a cutting board, and with a large, heavy knife, create 1/2 inch slices. The outer bits will fall off in very small pieces (this is a very good thing, you will see later), the inner pieces will be like cauliflower latticework. Line a large baking sheet with tinfoil. 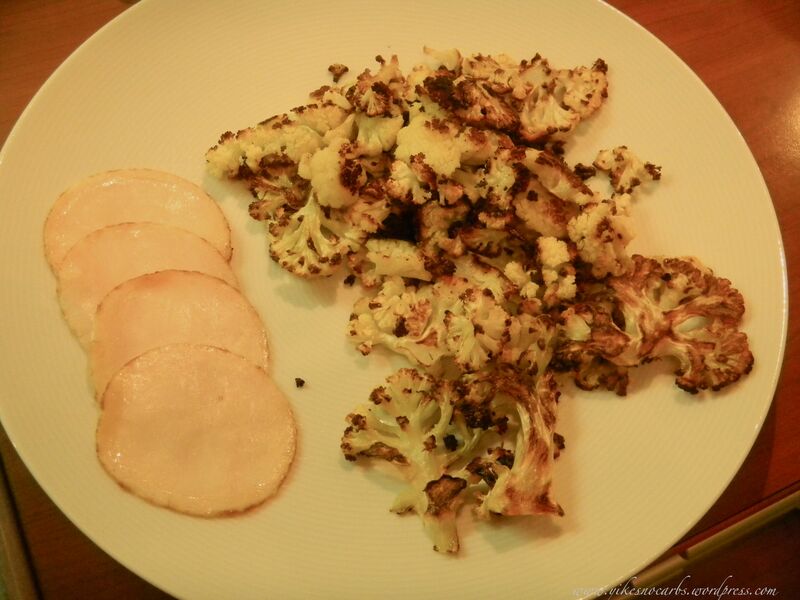 Toss the cauliflower with the olive oil, salt and pepper, and spread in one layer on the baking sheet. You don’t want it to get too crowded or it won’t brown properly. Bake the cauliflower in the oven for 10 mins. When it starts looking golden on the underside, turn with a spatula and return to the oven for another 10 mins or so. They should be nicely browned on both sides. Oh yes, another tip – don’t sprinkle the cauliflower with too much salt. After the cauliflower shrinks, it becomes saltier. Half a head of a medium cauliflower contains 7.8 gr net carbs. I’ve got a new brownie recipe to share. 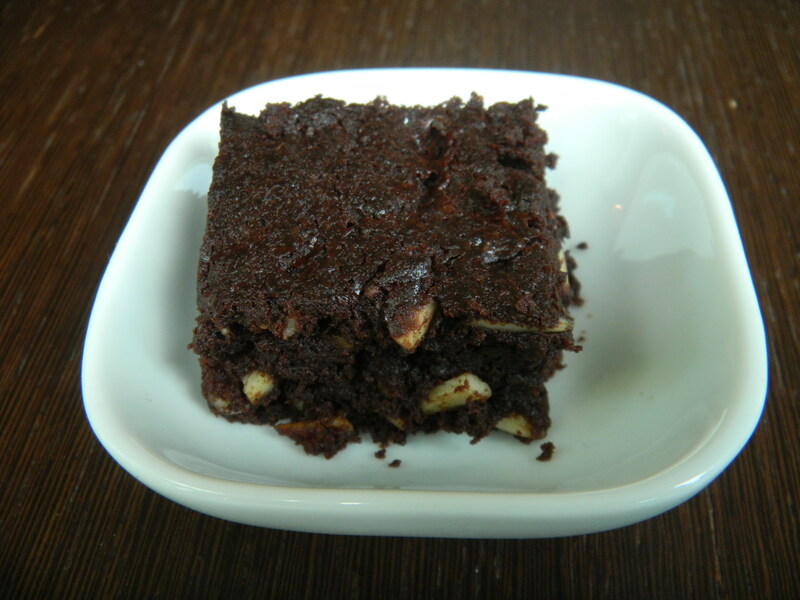 This is a brownie which you should enjoy still warm out of the oven. At this stage it is moist and soft. Once it cools down, it gets cakey but don’t despair. When you want to eat some, microwave the required amount for about 20 seconds. It will become soft again. 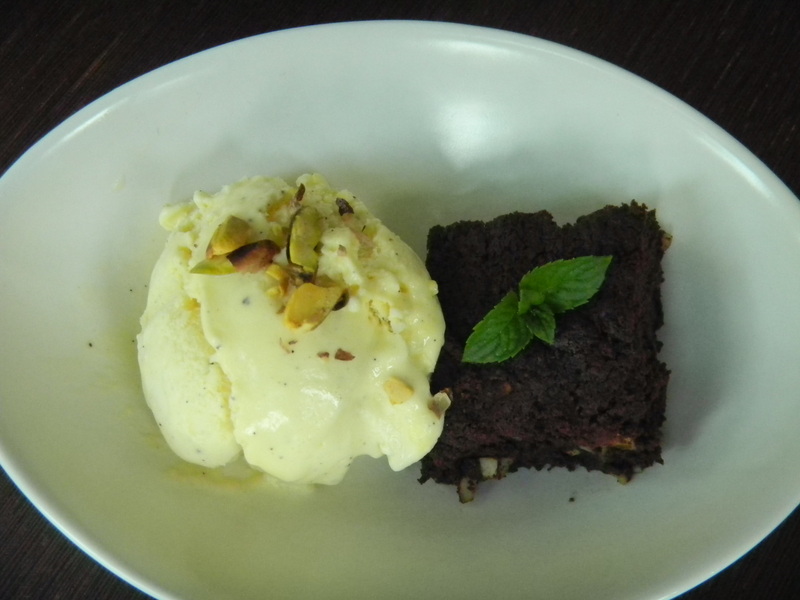 You can also eat your warm or cakey brownie with some vanilla ice-cream. Finally, if there are any bits left, crumble them up and freeze for later. Make some ice-cream and stir the bits in! I haven’t got that far yet. After I made this and had a bite, I thought, how could I possibly have made and enjoyed the brownie recipe I posted on 27 June 2010!! It was a brownie made of whey protein powder. Ok, so I had to get rid of my whey protein powder which I didn’t like. I still have quite a lot more, by the way. Somehow I just stopped making those brownies although you could whip them up in a jiffy. On second thoughts, that recipe is very handy when you want one or two portions and want to eat it in 5 minutes! So I won’t write it off yet. I was browsing through David Lebowitz’ blog (good question, what was I doing there?) and came across his recipe for Gluten-free Chocolate Brownies. I decided it looked ‘adaptable’ and that I would try to substitute the sugar with erythritol and use a dark chocolate with a high cocoa content. I got down to it yesterday. Out of the oven, as mentioned, the brownie was soft and moist and tasted very rich. After it cooled fully, it became a bit cakey but that could be because I did not follow the instructions fully. David does mention that if you do not beat the batter for a full minute till it pulls away from the sides of the metal pan, your brownie will be crumbly. Since I wasn’t going to run to the kitchen to bake another batch just to see if it turned out any different, I’ll take note of this and come back with an update some time in the future. If you’d like to try this, do go to his site (link above) and read the instructions carefully. The interesting thing about the brownie was that my blood glucose value after one hour was still low despite not injecting any insulin! I did this check twice – testing one hour after eating each piece. So thumbs up! Only 3.2 gr net carbs a piece! Line a square pan (David suggests 8 inch/23cm but I used a 7 inch pan) with two overlapping pieces of foil so that it goes up the sides to the rim and lightly grease the foil with butter (I used parchment paper and did not butter it). Preheat your oven to 350 degrees Fahrenheit or 180 degrees Celsius. Melt the butter and chocolate in a metal saucepan over very low heat. Add the erythritol and stir till melted. Remove the pan from the stove top and whisk in the eggs one by one. Sift the cocoa powder and corn flour together and mix this into the chocolate batter. Then beat the batter vigorously for at least one minute until the batter is no longer grainy and starts to pull away from the sides of the pan a bit. Fold in the nuts and turn out the batter into the prepared baking pan. Bake for 30 minutes until the brownies feel just set in the center. 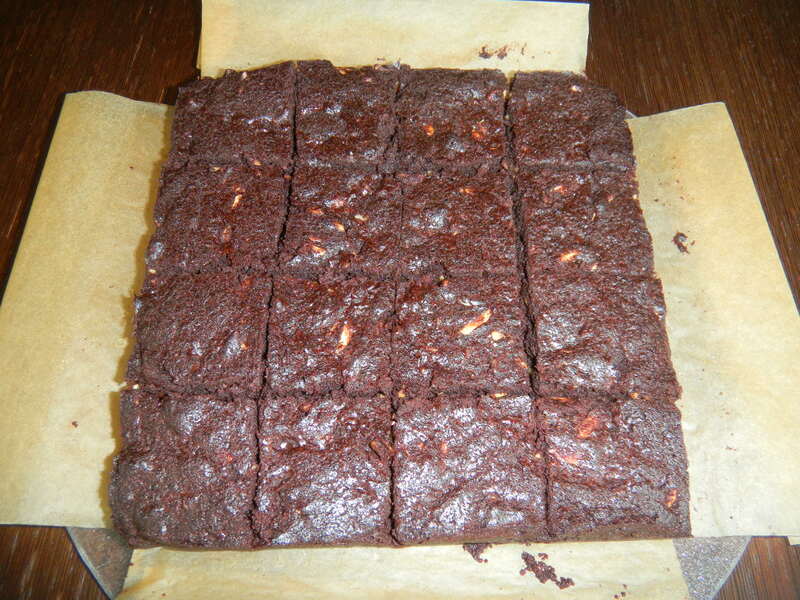 Cool the brownie till lightly warm before slicing into 16 pieces. Remember – this is best enjoyed still warm out of the oven. Later, when it gets cakey, that’s the time to eat it with a scoop of your favourite ice-cream. Freeze the rest for when you make ice-cream. After putting off posting a low carb bread loaf for so long, I’ve decided that this recipe below is good enough to share. I’ve been playing around with ingredient combinations for months, sometimes even forgetting to take note of what went in and this one is by far the best – to me at least. One thing I’ve noted and had problems with is the rising. At times, the bread will rise beautifully and at times, not much. That’s when the end result will taste gummy. Sometimes the gluten will get stringy and sometimes, it mixes in nicely. A tad more water may make the difference. I’m now so satisfied with the outcome of this bread I don’t experiment anymore. The problems with stringy gluten strands in the bread have disappeared after so much practice. Whatever you do, don’t use the bread machine, just put all the dry ingredients in a bowl and stir in the warm liquid gently with a spoon. Then use your hands to knead lightly into shape. Don’t overknead. I now throw in a handful of sunflower seeds and 1 tsp chia seeds everytime I make the bread. I’ve also put in some millet – but only because I was trying to get rid of the leftover millet in my pantry. Millet is not exactly a low carbohydrate item. Other suggestions are sesame seeds and pumpkin seeds. You might have other ideas. Heat your oven to about 50 degrees C for 10 min and turn off the heat. Put all the dry ingredients in a bowl and stir to mix. Add the buttermilk and water and stir gently. If it looks like the liquid is not enough, add more water bit by bit till you are able to form a nice ball. 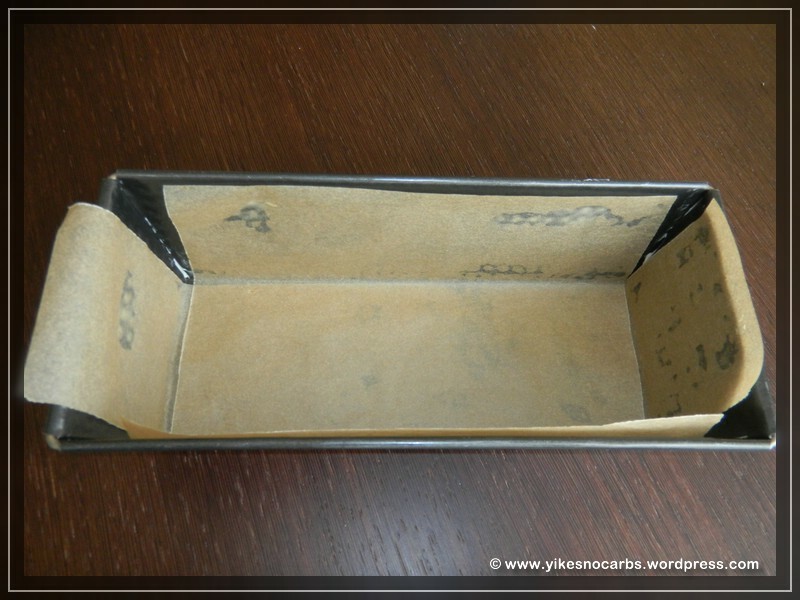 You can either put the ball on a baking sheet lined with parchment paper or put it into a loaf pan lined with parchment paper like illustrated below. I’ve also tried baking with a silicon loaf pan. I usually advocate baking low carb items with silicon wherever possible due to the ‘non-conventional’ ingredients which tend to stick heavily – except in this case. Although the bread literally fell out of the pan without any sticking after baking, the shape was something else. During the rising process, because the dough was heavy, it pressed against the sides of the wobbly silicon pan and expanded sideways. So although there was nothing wrong with the end product, it looked out of shape. If you don’t mind, then do use silicon because it is a blessing. Cover the pan with some tented aluminium foil and put it into the warm oven (switched off!) and leave the bread to rise for 50 min. Once the bread has risen, take off the foil, close the oven door and turn on the oven to 180 degrees C. Bake the loaf for 55 min. Take out and let cool. * You can also slice the whole loaf and freeze it, taking out the amount you need the night before. I usually freeze half a loaf and once the first half is eaten up, I will defrost the next half overnight in the fridge. * I would not recommend leaving this bread outside on the kitchen counter for too many days. It depends on the temperature. I left half a fresh loaf out in June when the day temperature was about 25 degrees C and it was covered in mold within 2 days. I must admit it was quite warm in my kitchen and I stupidly recycled a plastic bag which I had used for another loaf of bread. Now I’ve learnt. This bread is moist and this makes it a wonderful breeding ground for mold. However, if properly handled (like in the previous tip), you can enjoy this for up to 2 weeks. 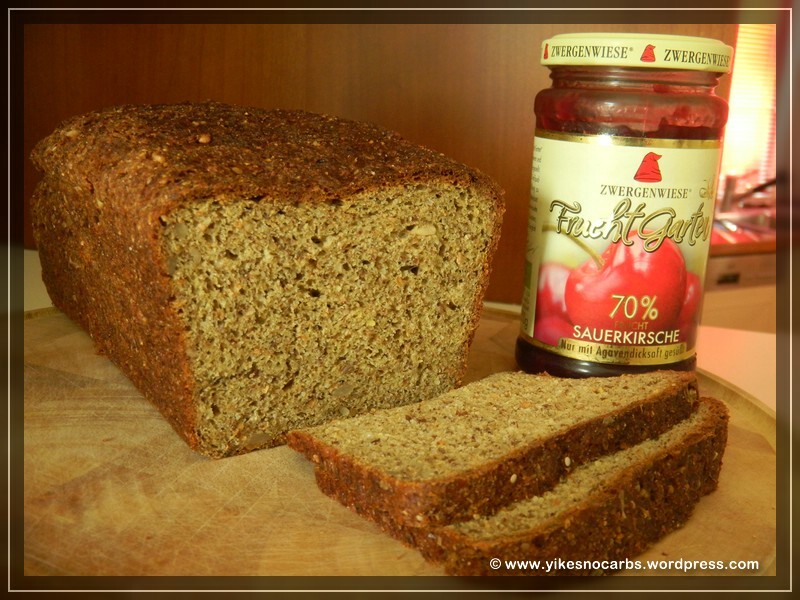 Total carbs for the whole loaf is 57.2 gr. With the success of the film Ratatouille by Pixar Animation Studios, more people now know what a Ratatouille is. If you’ve watched the film but didn’t pay attention to anything but the rat, the dish Ratatouille has nothing to do with rats! Funnily, the film did rekindle my interest in eating Ratatouille rather than dampen it. After having tried out the Chunky Pork & Chicken Terrine two days ago, I continued to flip through my copy of Cuisine. Old it is but somehow, I never got around to trying many of the recipes. With still a lot of terrine in the fridge to be eaten up and wanting to have something different to accompany it, I decided to try out their ratatouille recipe. In this recipe, the red bell peppers are replaced by green beans and a nice touch is the addition of feta. This sounded good! I did make two changes when I cooked the ratatouille – added a bit of diced red peppers and replaced the feta with diced mozzarella – because these were left over from a previous recipe and had to be used up. The recipe below is however, the one from the magazine. Ratatouille is a forgiving recipe. You don’t have to adhere to the exact quantities of the ingredients called for and can even add some other ingredients (within limits) to create your own dish. I can even imagine adding some olives, fried tofu and/or a sprinkling of chili flakes to give it a kick. Enjoy your Ratatouille as a main course or as an accompaniment to your mediterranean-style meat dishes. Place the aubergines and zucchini in a sieve, sprinkle with salt, toss and let stand about 20 min. Rinse and pat dry with a paper towel. Nutritional Facts – will have to add this some other time as I forgot to weigh all my ingredients. * click on Select a Category below. Selecting a category will display all posts in that category with the last post in that category appearing first. * click on Select a Tag to go straight to recipes containing this ingredient as one of the main components. * click on a Select a date in the calendar below.The post dates are highlighted in red. * For older posts, click on Find by month. All the posts for that month will be displayed. Want to keep track of what I write? © Yikes! No Carbs Please! 2010. Unauthorized use and/or duplication of this material without express and written permission from this blog’s author and/or owner is strictly prohibited. Excerpts and links may be used, provided that full and clear credit is given to Yikes! No Carbs Please! with appropriate and specific direction to the original content.